In the last several years, clear stand up pouches have been growing in popularity to package and display products. They give a good shelf presence which makes them an admired choice for a wide range of products. 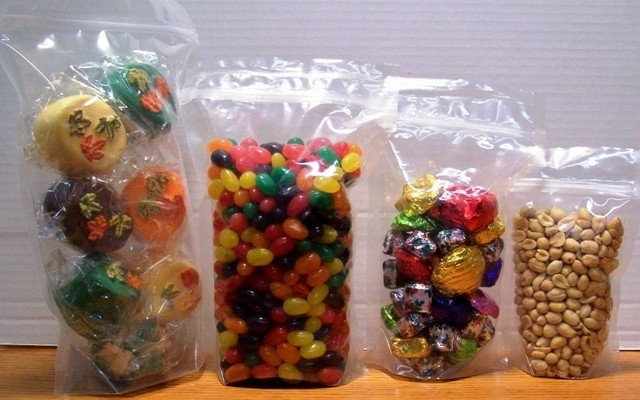 Clear stand up pouches are a popular choice to package Grab n Go impulse or point-of-sale items like caramels, chocolate, candy, nuts, snacks, trail mix and many other products. These clear heavy duty stand up zipper pouch bags are made of high-clarity and high-barrier laminated film. They are manufactured with 3.0 mil polyethylene and 0.5 mil polyester giving a total thickness of 3.5 mil. The layer composition of these bags along with the bottom gusset and 3/8” wide meshed side seals. Give the pouch bags a durable stiffness which enables them to stand up. Stand up zipper pouch bags provide moisture and gas barriers and excellent heat-seal strength so products stay fresh. 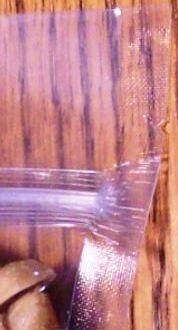 Zipper pouches are FDA approved for direct/indirect food contact. Suggested uses for stand up zipper pouches include: Snack foods, dried fruits, pet treats, nuts, powdered mixes, candies, confectioneries, bath salts, spices, tea, granola, pasta, frozen foods, bulk packaging, portion packs and other applications. The re-closable zipper on the stand up pouch bag is always located on the short side of the bag at the top of the bag. The measurements of stand up zipper pouches are outside overall dimensions NOT the inside bag dimension. Dimensions stated are subject to a slight variance. WIDTH IS: The measurement across the open end where you fill the bag. NOTE: Measurements listed are overall outside dimensions. What is the difference between a Pouch and Gusseted Bag? A pouch has only a bottom pleat (Gusset) the rest of the bag is constructed like a flat bag. A pouch will hold less volume than a gusseted bag. out like a brown lunch bag or brown grocery bag would have. A gusseted bag will hold more volume than a pouch.